For his birthday, Steve wanted to visit the Cape Ann Brewing Company in Gloucester. They brew the “Fisherman’s” line of beer that Steve enjoys, especially their pumpkin stout. The pub is large and family friendly, with communal trundle tables and games to play as you wait. The menu is simple hearty fare and what you would expect from a pub in Gloucester: fried or baked seafood, burgers, fries, mac and cheese, etc. I know nothing about beer, so here is the description from the website of the beer Steve had. He enjoyed it enough to order a second pint. Originating in England, porters evolved from a blend of beers known as “three threads” . A precursor to stout, porters are said to have been favored by porters and other physical laborers. Medium bodied, rich roasted character with hints of chocolate and a faint bit of caramel. 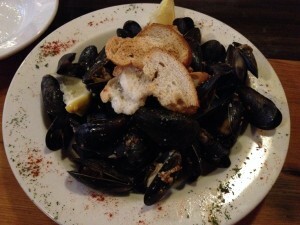 I had the PEI mussels ($10). They were sautéed with Fisherman’s Kolsch Ale, coarse ground mustard, garlic, and lemon. The mussels were tender and the broth had nice flavor, with a kick. My only complaint is that the bread was charred broken pieces of cottony Italian. I also ordered fries, which were an exorbitant $7, only $3 less than my large plate of mussels. They were hand cut and crispy, but chipotle aioli did nothing for me. Steve had the swordfish kabobs ($16) with quinoa, Kerry had the meatloaf special ($15) and Bryan ordered the baked haddock ($16). Everyone seemed to enjoy their food and the waitress was friendly. There was a 30 minute wait on a chill Saturday night, but we found some seats at the bar for the first round of beers. I will let him know!